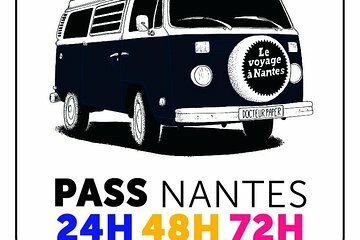 Upptäck Nantes med ett 24-, 48- eller 72-timmars Nantes City Pass och njut av fri entré till flera stadens attraktioner, obegränsat utnyttjande av kollektivtrafik, samt en rad turer och rabatter. Rid den fantastiska Marine Worlds Carousel, gå tillbaka i tiden på Grand Castle of the Dukes of Brittany och ta en scenisk kryssning längs Loirefloden - allt med ett stort värde, lättanvänt kort. not only finding parking, but even finding the tour office to pick up my voucher. I finally decided to your the chateaus around Nantes by auto on my owm. In fact, I found it much easier getting around by auto OUTSIDE Nantes. Perhaps I will try to do a bus tour on my own on Sunday. I cannot date the Nantes one day pass because I was not able to use it. Excellent value 24 h pass. We visited Duc de Bretagne castle, which included the Nantes Museum and an amazing exhibition on Columbian gold. Needed much longer in the museum as it is several floors and very interesting. Used pass for excellent City Tour with English commentary, as advised at tourist information centre. The trolley bus commentary is only in French Went to La Machine exhibition in the afternoon by tram - fantastic. To get best value from pass, collect it the day before you want it and validate it as soon a you need it. Then you could use the early morning transport. Only negatives: you cannot book the cruise or elephant ride at the Machine in advance on the website and they were both full on the day we went. Apparently the cruise commentary is only in French. Even though you have the pass you still have to queue at attractions for an entrance ticket. This was a long queue at the Machine and pass holders do not get priority.. The only reason I did not give this more stars was that we were not able to fully take advantage of the things included due to our short cruise port stay. Otherwise it would be worth it to do the river ferry and other options. The mechanical museum, Les Machines de I'ile, is a must and entrance is included in the City Pass. The queue gets rather long, so going earlier is best. The Petit Train was fun but be forewarned that the audio is in French. You are given a printed version in English and can follow along only by the corresponding photos. The Petit Train does not stop anywhere, so it a round trip ride. Nantes ended up being a surprisingly great experience.